All parents want their daughters to marry godly young men. But which qualities, specifically, should they be looking for? What will you say when that certain young man sits down in your living room, sweaty-palmed and tongue-tied, and asks your permission to marry your daughter? What criteria should he meet before the two of them join together for life? What He Must Be… If He Wants to Marry My Daughter outlines ten qualities parents should look for in a son-in-law, including trustworthiness, a willingness to lead his family, an understanding of his wife’s role, and various spiritual leadership qualities. Author Voddie Baucham follows up on his popular book Family Driven Faith with this compelling apologetic of biblical manhood. 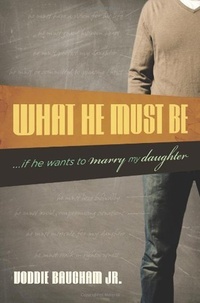 By studying the principles outlined in his book, parents who want their daughter to marry a godly man-as well as those who want their sons to become godly men-will be well equipped to help their children look for and develop these God-honoring qualities.